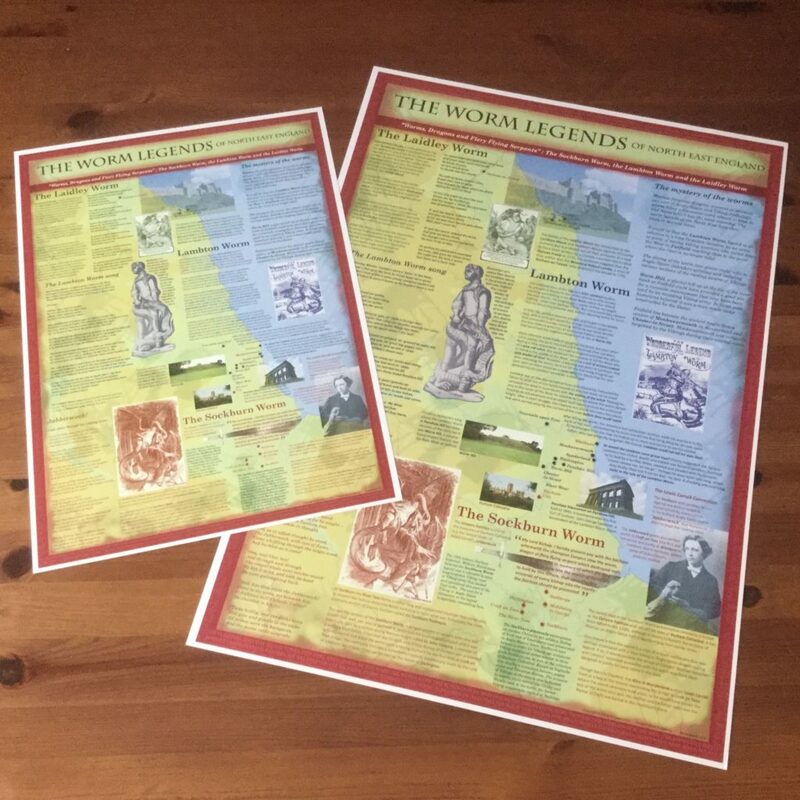 County Durham-based Tangled Worm is a new North East based business publishing poster prints with a bit of difference with an emphasis on Northern heritage, fun facts and just a little frivolity. 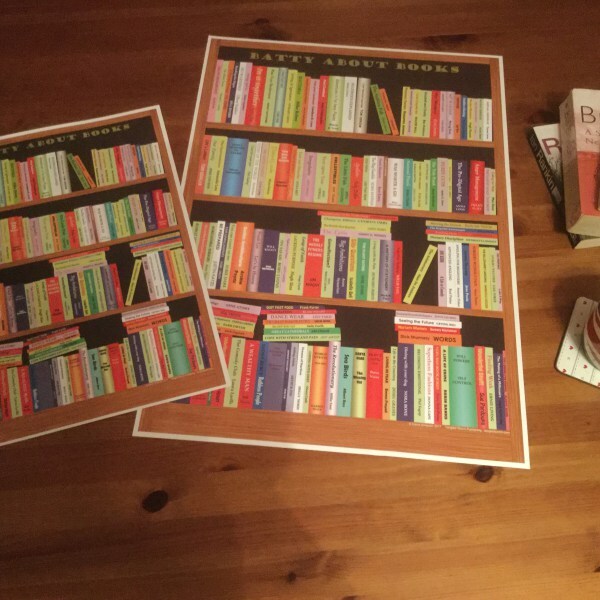 “We specialise in colourful poster prints with an emphasis on information, quirky facts and northern history as well as occasionally delve into other educational themes like science” says owner David Simpson, 50. 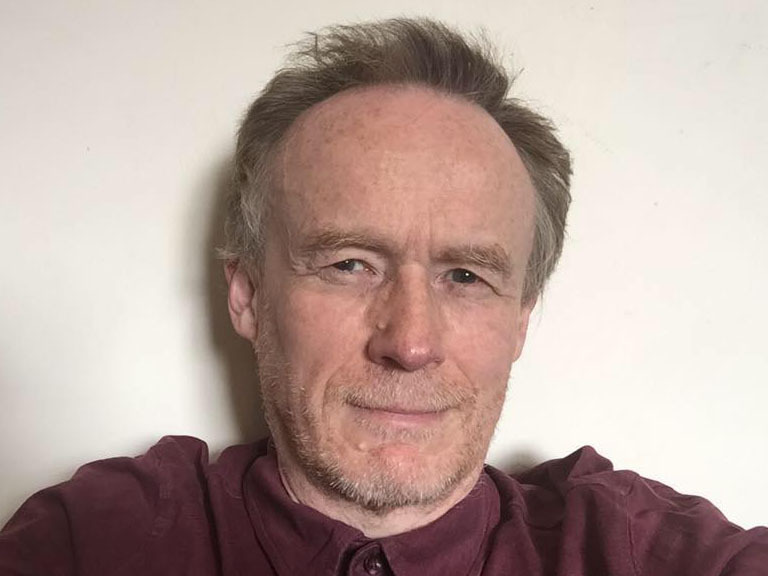 Based near Durham City Tangled Worm was set up in November by David, a former writer with The Northern Echo best known as the author of a number of books about the North East. “I want to produce prints that are colourful, fun and informative” says David “and I’m especially keen to focus on Britain and particularly the North of England but also want to produce prints that are just for fun”. One of David’s most popular prints is a map featuring over 1,000 rude and curious place-names in North East England which includes such wonders as Common Slap, Old Man’s Bottom, Comical Corner, Goodwife Hot, Make Me Rich, Crackpot and Stinking Goat. It also includes explanations for some of the more familiar unusual names like Pity me and Unthank as well as a wide range of place-names with an international flavour like Moscow, California, Boc Chica, Philadephia and Toronto that pop up throughout the region. Northern history themed maps include the troublesome Border reiver surnames: Robson, Charlton, Milburn, Elliot, Armstrong and many others whose murderous raiding and livestock rustling culture dominated Northumberland and neighbouring border counties in Tudor times. The map includes a few tales associated with some of the most notorious reiving families. 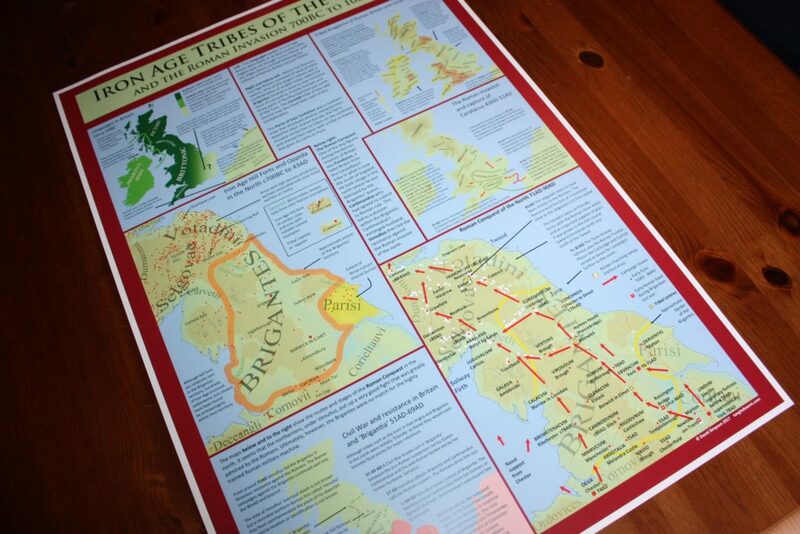 Representing a more distant period is a map showing the Iron Age tribes of the North and the routes and events of the subsequent Roman invasion. Another map features the principal Roman features of the North and two very detailed poster print maps depict the Kingdom of Northumbria in the Viking age and in the pre-Viking era complete with details of raids, invasions, murders, settlements and lists of the all the Kings and Earls based at Bamburgh and York. It’s not just about history though, Northern culture is well represented. 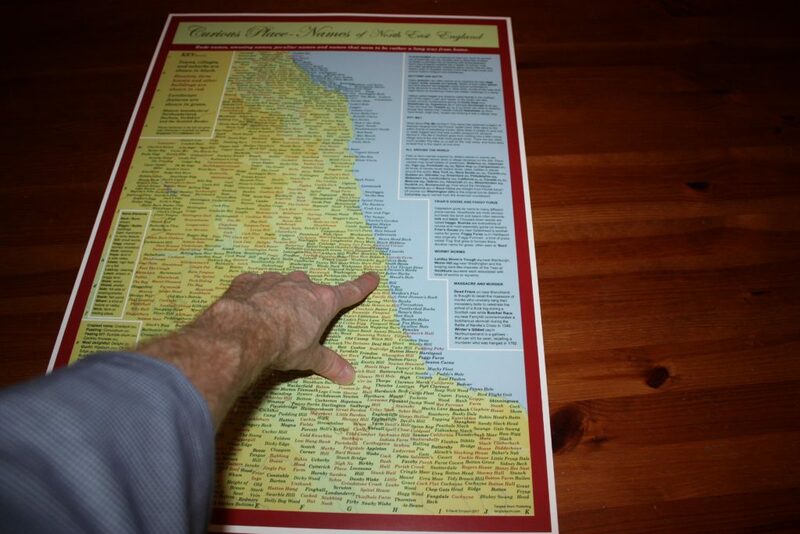 Products include a Geordie Dictionary poster featuring explanations and origins for over 500 North East words and a unique map showing the names of 1,400 notable northerners ranging from scientists, celebrities, singers, comedians, inventors and notable industrialists from Liverpool, Manchester, Leeds and Hull in the south all the way up to Berwick. All the northern counties from Cheshire, Lancashire and Yorkshire up to Northumberland are featured. There’s even a map depicting the North East ‘worm’ legends which provided the inspiration for the business name. In case you’re wondering, worms are wyverns, legendary serpents that feature in ancient stories that are entwined and entangled with the mythology of invading Vikings, Angles and Saxons. David says he loves unravelling such tales and history in general to reveal strange roots and sees the world as a place of entangled mysteries and puzzles waiting to be solved, untwisted and enjoyed with wonder. 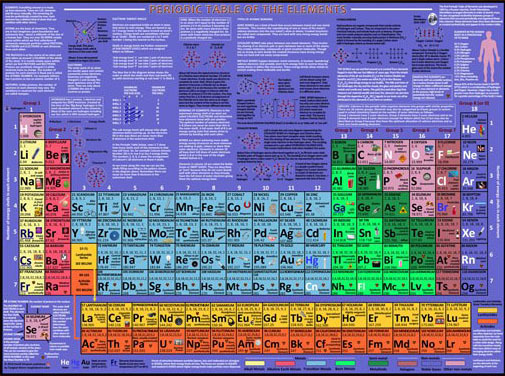 This goes for science too – his colourful Periodic table is one of his latest additions which explains how the elements combine in ways to make up our universe. DAVID SIMPSON explores the origins of the word ‘Geordie’ and the changes in its meaning over two centuries. 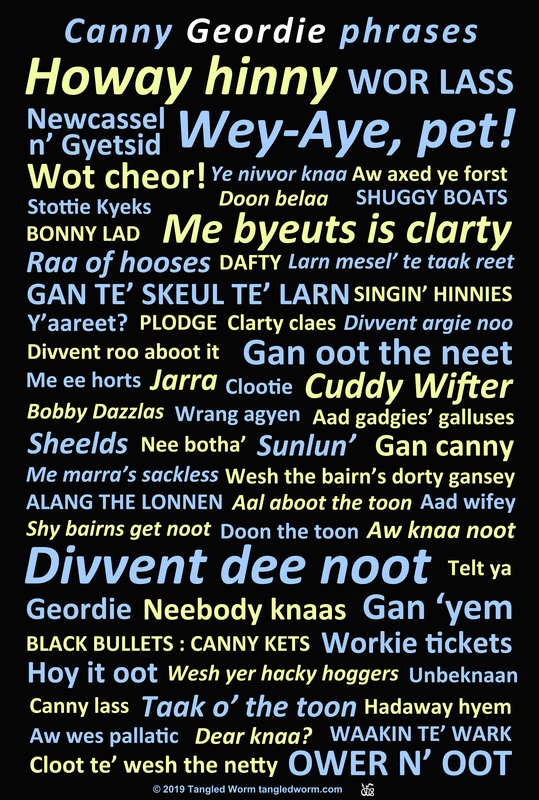 Also see our Geordie Dictionary pages in our roots and dialect section. So who or what is a ‘Geordie’? 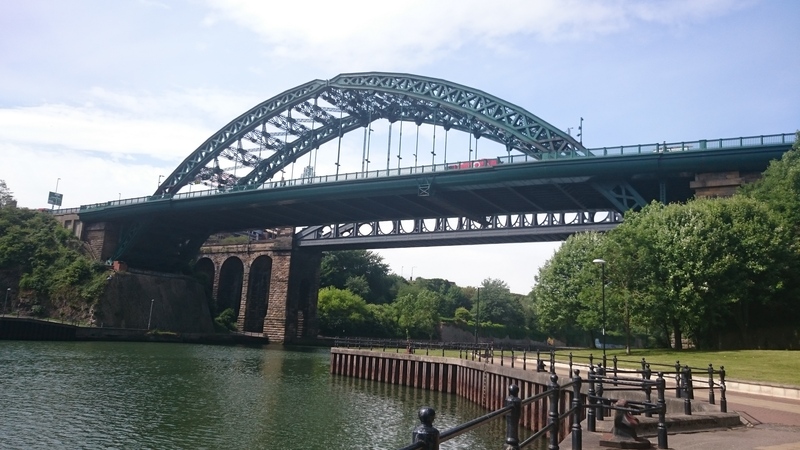 ‘Geordie’ is the name given to the natives of Tyneside or at least that’s what the term has come to mean today but what is the origin of this word? Well to put it simply in one sentence: Geordie is a nickname for someone called George. That’s just about the only thing we can say with certainty in regard to its use in North East England. 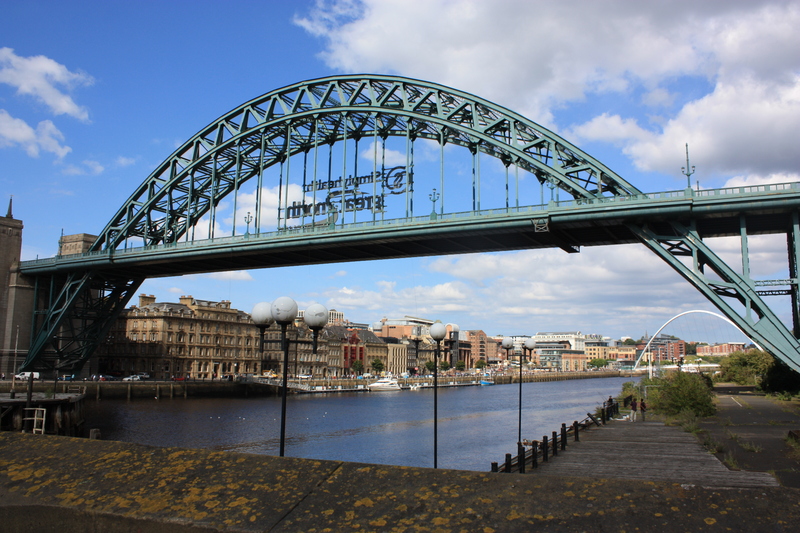 How Geordie came to be associated with Tyneside has a number of different theories and it’s worth exploring a few of them here. Just don’t expect a definitive answer that’s all. Mostly ‘Geordie’ words and phrases from North East England. In the 1700s, just as today, ‘Geordie’ was the prevalent pet form of the name ‘George’ among the Scots and the people of the far north of England and since there was a succession of four ruling kings called George from 1714 to 1830, it was a very familiar name. Its use and adoption may very probably reflected the opinions and feelings of the populace towards their ruling monarch at any given time. My personal favourite theory for why Newcastle in particular came to be the home of the ‘Geordie’ is linked to the Jacobite Rebellion of 1715 when the town closed its gates to the Jacobite army that had mustered strong support across Northumberland. The Jacobites, named from ‘Jacobus’ a Latin form of James, wanted to place James Stuart, the Catholic ‘Old Pretender’ on the throne. Newcastle had other ideas however and declared its support for the reigning King, ‘Geordie’ : King George I, the German Protestant, who couldn’t speak a word of English. This is a neat and very satisfying explanation perpetuated by writers and historians during the later half of the twentieth century – myself included. Even the late Bill Griffiths in his wonderful thoroughly researched ‘Dictionary of North East Dialect’ (2004) examines the origins for different definitions of ‘Geordie’ but can only point to an article in The Northern Echo newspaper (August 1997) to support the Jacobite theory. Now, I have to confess straight away and say that I was in fact the enthusiastic young author of that particular newspaper article. I was merely repeating a theory that had more than once been thrown around by late twentieth century writers such as David Bean. In his book ‘Tyneside : a biography’ Bean admittedly added a cautious element of doubt to his colourful explanation with the phrase: “Or so it is guessed”. 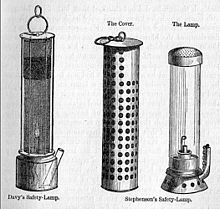 He then went on to make the familiar suggestion that it came from the use of Stephenson’s Geordie lamp. Go back more than half a dozen decades earlier to the nineteenth century and you will find a legion of writers and researchers who left no stone unturned in their quest to explore and explain every facet of local culture and dialect. Not one of these – as far as I know – makes any mention of a link between George I and ‘Geordie Newcastle’. 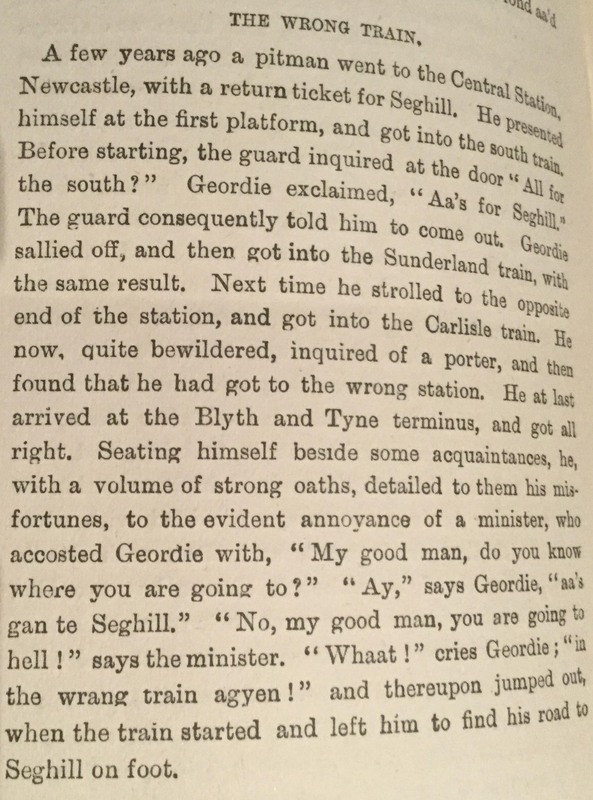 In fact as a written record it is not until the last decade of the nineteenth century that we get any reliable evidence that ‘Geordie’ was specifically associated with Tyneside. It does seem though that it was a name given by outsiders. In 1892 Richard Oliver Heslop’s, two-volume tome entitled ‘Northumberland Words’ was published. This work formed the basis for late twentieth century Geordie publications like Cecil Geeson’s ‘Northumberland and Durham Word Book’ (1969) and Frank Graham’s ‘Geordie Dictionary’ (1974 and 1987). In one of the shortest entries in his glossary, Heslop explains that ‘Geordy’ is the name by which Tynesiders are known outside the district. The use of the word ‘outside’ is curious because it suggests the term was not yet accepted onTyneside itself or at least not accepted by the middle class audience at which Heslop presumably aimed his work. Heslop said that ‘Geordy’ is also the term for a Tyne ship and for George Stephenson’s miners’ safety lamp. 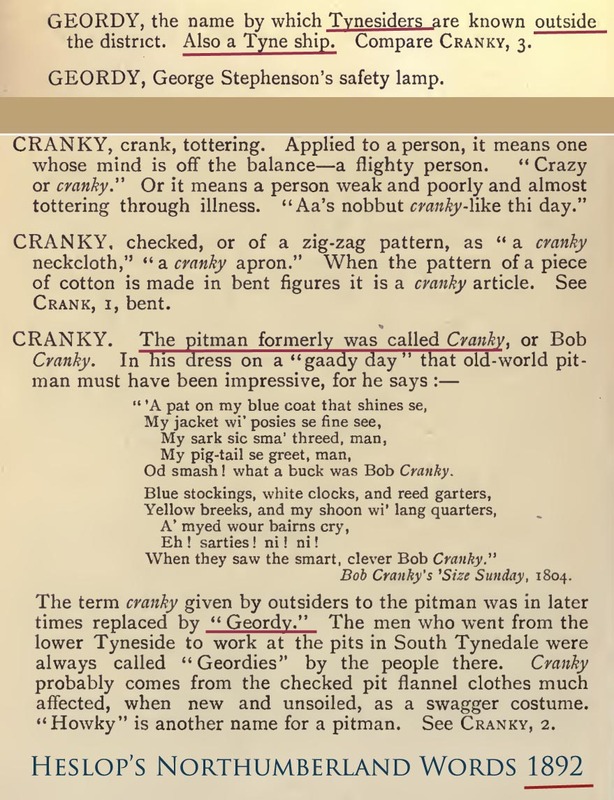 However, it is in Heslop’s accompanying cross reference to the related term ‘Cranky’ that we find a clear indication of the earlier meaning of ‘Geordie’. Heslop reveals that ‘Cranky’ or ‘Bob Cranky’ was the popular old term for a miner in the region and cites its use in a phrase from a local song dating from 1804. Heslop says the phrase was in later times replaced by ‘Geordy’. A linguist, Katie Wales, concurred on the association between Geordies and miners and pointed to an early use of ‘Geordie’ as a reference to miners in local ballads and songs from as early as 1793. The use of the term in this respect will have been reinforced by local miners adopting George Stephenson’s safety lamp (invented 1815) which they nicknamed the ‘Geordie’ or ‘Geordy’ if we are to use Heslop’s spelling. Heslop, who was of course writing for a Northumberland and Tyneside readership gives an early link between the miners of Tyneside and the term ‘Geordie’ as he says “the men who went from the lower Tyneside to work at the pits in South Tynedale were always called ‘Geordies’ by the people there.” The date at which the Tyneside connection to ‘Geordie’ came into being in South Tynedale is not clear. Almost half a century earlier, in 1847, John Brockett’s two volume ‘Glossary of North Country Words’ published in Newcastle upon Tyne opted for the spelling ‘Geordie’ which he describes “as a very common name among the pitmen” and showed that it was a form of address between them. He further confirmed that “the pitmen have given the name of ‘Geordie’ to Mr. Stephenson’s lamp in contra-diction to the Davy, or Sir Humphrey Davy’s Lamp”. Brockett made no mention of Newcastle or Tyneside in relation to the term Geordie. Most of the evidence from the Victorian era points to ‘Geordie’ being a widely used for term for miners in the region. However, another source, J.P Robson’s ‘Songs of the Bards of the Tyne’ (1849) said that it was used as a word for ‘rustics’. The first occurrence of the word ‘Geordie’ in ‘The Oxford English Dictionary’ is in 1866 as ‘Jordies’ and is defined as “the sailors belonging to the ports on the north-eastern coast of England”. Of course, this may have been the south country or London understanding of the term. London, remember was constantly visited by sailors from the North East coast as part of the coal trade. Only three years later, in 1869, John Camden Hotten, a London bibliophile and expert on ‘slang’ contradicted the Oxford Dictionary stating that Geordie was a “general term in Northumberland and Durham for a pitman or coal-miner.” He stated that that the origin was not known and that the term had been in use for more than a century. The degree of certainty in Hotten’s statement is not known but it places the origin of ‘Geordie’ when defined as a ‘miner’ back before 1769. There is, however, an early reference linking the term ‘Geordie’ specifically to Tyneside in relation to shipping. This occurs in the Sunderland section of William Fordyce’s ‘History of County Durham’ (1857). Here Fordyce mentions that a “recent periodical supplies us with the curious information that mariners term a vessel from the Tyne a Geordie and from the Wear a Jamie.” It’s a tantalising link back to the Jacobite theory but there’s no evidence to suggest that Sunderland had been particularly pro-Jacobite. On the same page in relation to shipbuilding, Fordyce makes the remark that “it was derisively said that the Sunderland shipbuilders could either make a ship or build one” as the quality of the workmanship was seemingly regulated by price on Wearside. This was possibly an early origin for the term ‘Mac n’ Tac’ (later ‘Mackem’), used by outsiders in reference to Sunderland that perhaps regained prominence around the 1960s but seemingly was not familiar to Wearsiders until around the 1980s when the insult was enthusiastically adopted and became a badge of honour in much the same way that the ‘Geordie’ insult was adopted on Tyneside. On further investigation it becomes clear that ‘Geordie’ seems to have originated as an insult for a miner (and perhaps a mariner). At the very least it was a patronising term and seems to have been a byword for a fool. Frank Graham suggested that the word originally literally meant ‘fool’ and linked it to the madness of King George III who reigned from 1760-1820. ‘Geordie’, as a slightly patronising term for a pitman was still widely used in the late nineteenth century. From 1887 to 1891, a popular Newcastle-based publication called ‘The Monthly Chronicle of North Country Lore and Legend’ explored the heritage and culture of Northumberland, Newcastle and occasionally County Durham with a middle class readership in mind. 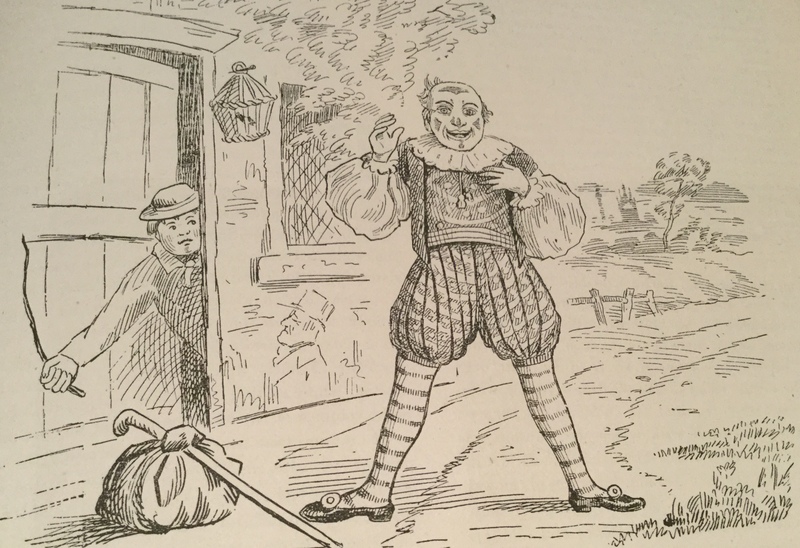 Generally this publication is full of wonderful informative articles and illustrations but its pages also include countless features on local ‘North Country Wit and Humour’ usually featuring ‘Geordie’ who is almost always depicted as a generic pitman and a bit of a fool. In these features the pitman or ‘Geordie’ includes miners from as far south as Castle Eden near the Durham coast. Frank Graham held the view that the middle classes of Newcastle once feared the miners and patronised them with the term ‘Geordie’ but over time, during the twentieth century it became a more friendly accepted term that was widely adopted across the region. Graham was himself a rather colourful character. He was the Newcastle-based author and publisher of hundreds of small scholarly books for the general reader mostly featuring Northumberland history. Born in Sunderland, he was a noted Communist who had voluntarily fought in the Spanish Civil War against the Fascists. In addition to his Geordie Dictionary, Graham was perhaps best-known as the publisher in 1969 of the tongue-in cheek ‘Larn Yarsel’ Geordie’ written by the humour writer and art teacher Scott Dobson of Blyth. At around this time Geordie was primarily associated with Tyneside but still often widely used in a broad sense for all people across the region in Northumberland and Durham. It was, it seems only in the 1970s and 1980s, perhaps in part due to increasing football rivalry, that ‘Geordie’ became much more exclusively associated with the people of the lower Tyne.